Yes, an, early-in-the-week, shoutout to Brené Brown. And rightfully so. If you are job searching, you know that radio silence at 5:00PM EST on a Friday afternoon is just about the worst thing for an individual’s anxiety and general weekend happiness. You will also agree that there are only so many times an individual can refresh their email before they ultimately close their computer with great frustration. I’ve certainly had my own fair share of computer-closing conundrums. Have you ever heard this phrase? Lame, right? True, right? Scary, right? Real, right? Yes, to all of these things. And similarly, a watched pot still won’t boil, even in spite of this post. Alas, moving forward. I touched on my current job search a few weeks back, and my sentiments are still just as valid today as they were then. When you submit to job searching, you release basically all of the control associated with your current reality. The, “You’re interviewing them just as much as they’re interviewing you,” adage is nice, however the truth is, they still have to provide you with the opportunity. Sure, you can be exploring whether or not there is a fit associated with said-job, however none of this really matters if they haven’t made an official offer. You just need one offer. “One,” she muttered back at me, with great resistance. Yes, one. Of course, choice is nice, however at the end of the day, choice is basically just a conjured up expectation of the privilege we hold in having most things go our way (speaking generally, that is). How is it that we are at this point as persons and professionals where we have to have dozens and dozens of choices in order to know if one is “the right one?” When I was in graduate school, I was always so turned off by the peers in my cohort who had 15-25 interviews for various jobs. Yes, 15-25. How they did the research alone for each job is beyond me, however I can’t help but just prefer a more limited pool of options. The beauty (beautiful disaster, for some) of a limited choice is that you never truly know if you’re making the right one. And you don’t need a massive amount of options to have this understanding. Ultimately, you just need one – one assistantship, one institution, one job, one opportunity. This was certainly the case for the student I formerly advised, and she would later achieve that post-grad milestone with ease. You just need one. Now, despite my own advice to former students and current friends and colleagues, I still cannot seem to apply my guidance to my own search. For example, I spend a bit of time every day, trolling through old emails, and attempting to read between the lines of some of the email exchanges I have had with potential employers. They said, “…end of this week, early next week,” but what the hell does that mean? Do they know I really want this? Do they know I am so much more than what my resume reveals? 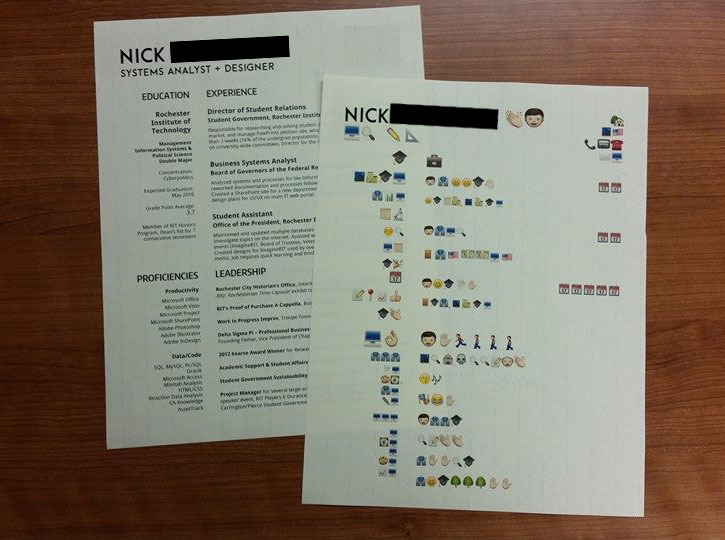 Should I send them a copy of my resume in emoji-form? This is typically my thinking as I challenge nearly every aspect of the various processes I am experiencing. Thankfully, I know I am not alone in this delusion. And to be honest, we have to stop doing this to ourselves. We have to stop job searching as a game, collecting interviews as trophies. We have to stop measuring our professional worth by the number of interviews we receive. We have to stop creating choice when we actually have a better understanding of standards and expectations, and how these values play out in our own professional preferences. I discovered this “ah-ha” just before I went to graduate school for higher education. I remember sitting in the interview holding room with other candidates, and overhearing one individual in particular talk of having six assistantship interviews lined up over the course of the weekend. Shortly after this declaration, he also made it very clear that there was only one job he would take, regardless of how well the other opportunities were presented. This pissed me off. I had made friends that weekend with individuals who had just one interview, and some coming to the Midwest to interview from as far as both coasts. And, sadly, this interview-collecting individual would later become shining example of many more annoying colleagues to come. And here I am, half a decade later, navigating through the murkiness yet again. But this time, the murk feels good. Well, yes, it is scary and unpredictable, but it feels good. Trusting the process feels good. One, feels good. And that’s all I (you, we) need: one. I was affirmed of this recently when one of my best friends posted about some of her own journey. She, too, is sifting through the murky waters with me, dealing with her own layers of transition. I have cited her blog before, and stand by my belief that she is one of the most brave and inspiring individuals I have ever known. She recently posted some specifics related to her own search, a lot of which aligns with many of my own “ah-ha” moments. No process is the same. For all those job searching, job switching, or anyone who merely lives curious enough to leave their current position and head on to the next, stop dress-rehearsing tragedy. Know that you are good enough, worthy enough, and talented enough. You are enough. Pause and find the good in this moment. Just as my friend is finding a change of pace, I wish you the same solace and understanding. Patience. I wish you patience. Hold on. Breathe. Stress…but not too much. Be invested. Read between the lines. Be unconventional, be passionate. And, above all else, remember you just need one. One is all you need. I spent this past weekend in Seattle, facilitating a leadership retreat for the University of Washington. On my flight from Denver to Seattle, I boarded the plane per usual, got “comfortable” in my middle seat, identified out how my 6’2″ frame would settle for the next three hours, and took the deep, and-here-we-go-I’m-about-to-be-in-the-air, breath. Up to this moment, it was a pretty typical travel experience. And that’s when it hit me, I had to pee. Bad. By this point, the plane’s door had been closed and the flight attendants were maneuvering through the isles with purpose. And, in what felt like the longest lapse of time I had ever encountered, twenty minutes had passed and we were still taxiing and still on the runway. I’ll be honest, this was the point when I started contemplating my current reality: How long can one actually hold it? Is my bladder normal-sized? Is, “normal-sized,” an offensive term re: bladders? Will I be thrown off this flight for getting up during taxi? How much can one (bladder) truly endure? Where is Justin Guarini these days? I was in a real life dilemma, and one which could certainly scar me for the rest of my life. And that’s when I peed my pants. Okay, I didn’t pee my pants. However, I did seriously consider this as a viable option. Thankfully, and after enduring a forty minute hell-in-the-skies, I sprinted down the isle to seek relief and bathroom-refuge. We do this a lot, don’t we? I’m not talking about waiting to go the bathroom before it’s too late (although you already know I have had my fair share of struggles in this area). I’m talking about that point where things become so assumably unendurable, and we either, A. Think in a dramatic and extreme manner, or, B. Do something stupid. Thankfully, I didn’t actually pee my pants, however I honestly and truthfully actually considered this as an option. Let’s pause here for a moment. It’s no secret that I’m in a job search right now. How’s that for not having any control? If there were ever a time where you metaphorically felt like you desperately had to use the bathroom and could not actually do so, it’s while searching for jobs. The idea of “feeling ready,” yet with no opportunity, is resonating with me. And more so, “feeling ready” and seeing opportunity, yet having to pause and be patient for the circumstance to flourish, strikes a chord. I know many friends and colleagues are in a similar boat, and I have found some nice solidarity with those who have reached out during this time. It does, however, still remain a very unsettling feeling. “What if…,” can be the scariest thing we experience as young professionals. And, consequently, “What if…,” can also be the best thing for us. Not having control of a situation or experience (in a healthy context) is often needed and celebrated. I know I need to better embrace this concept in my current reality, and I’m working on celebrating it as a value. But, I don’t think we’re talking about this. I don’t think we’re talking about the realities of those moments when you don’t find the bathroom in time, or you hustle as fast and as hard as you can, and still have to deal with the consequences of an accidental stumble (while, still going with this, almost-peed-my-pants, metaphor, of course). Does this make sense? Associations and colleagues spend a lot of time mentoring professionals and graduate students, painting pictures of easy and seamless processes. Unfortunately, I believe we are somewhat failing to acknowledge that, at times, you’re going to possibly pee your pants. I have previously aired my thoughts regarding the state of education these days, and I think there are similar sentiments in this piece as well. Specifically, let’s have real and raw conversations – let’s be honest about our current realities. Let’s grow and learn and develop. Let’s talk about control. We’re not really talking about control. We’re not talking about power, and the systemic and societal power that exists in the form of privilege, oppression, capital, etc., and how this relates to a job search. These conversations are essential to growth and continued understanding. When I lived in China this past fall, a friend and I talked a lot about the idea of control, and how it plays out when you’re a foreigner in another country. Ultimately, as a visitor and traveler, you have no control. Sure, you can go out, walk around, and exist pretty normal depending on what country you’re in, however at the end of the day, you’re still a visitor. Your passport is everything. And in today’s context, the bathroom is everything. Where is your bathroom? What is your bathroom? In those particular moments with my friend in China, I was affirmed by vision, and by hoping and dreaming. And, of course, I was also humbled by the pause it requires to truly trust the process. Truly. Are you trusting the process? Is the process trustworthy? What can you control in this moment? In what you’re going though, what cards can you play to move closer to a healthier and more seamless process? Are you vulnerable yet? “Dissonance is learning.” This was said to me by a mentor last year and has stuck with me ever since. I believe this. I experience this. I live for this. Earlier this afternoon, I had the opportunity to facilitate a conversation with a group of sixteen colleagues and fellow staff members. During that conversation, we discussed the Karen Klein article, “Enough of the bubble-wrapped college student,” which was sent to me by a dear colleague from another division. How often are people doing things for the pure joy of learning? I know a man who has already achieved two bachelor’s degrees, a master’s degree, and a PhD, however he is still taking college classes. Why? Learning. He literally says, “Learning.” How often are people doing this? Think about college and the structural set up created around higher education. I would argue that most people are going to college for, first and foremost, a degree. This is also a factor in people’s goals of joining organizations, volunteering, or simply connecting across communities and campuses. There is always a need or want for something tangible at the end of those experiences. A degree, if you will. One colleague today shared a story from graduate school where the professor had each student write their dream grade on a piece of paper. After everyone had turned in their grade, he replied to the class, “Alright, you can have that grade. Now, let’s let the learning begin.” No trial and error, no stress over, “getting it right,” etc. At that point in time, the only thing left to do, in addition to the risk-free assignments, was to learn. I was dumfounded. What about the pure joy of helping someone else? Or even, just, “Good, hard work?” Again, there is this need to ‘get something out of everything’ that places a barrier between learning and achieving. Can you have both? What does both look like? Klein cites the student experience as, “bubble-wrapped,” and I would have to agree, though adding that there is also a fear of creating dissonance. Fundamentally, I believe dissonance truly is learning, and in so many ways we are failing students by ensuring that they are all receiving a medal (in whatever form, “a medal,” might mean). At the core of this profession, are we okay with students or people failing? How do we define failure? How do they define failure? I am sure we can all cite example after example, where we bubble-wrap our student leaders, thus limiting real and raw perspective. Much of what students learn in the classroom assists in their post-college experiences, however the same can be said for the co-curricular moments. Are we part of the problem in preventing learning from occurring, specifically learning that might aid a student long beyond their college years? The term, “Helicopter Parent,” is a reality in higher education, and it’s weekly that I have some type of conversation with a parent regarding their frustration, suggestion, and/or recommendation related to their student’s experience. The more I think about the role of parents, I also have to step back and think about our own role in the lives of the students we work with every day. Regrettably, I would challenge this notion of, “helicopter parenting,” and add a new layer of hover: “Helicopter Professional.” I work with some phenomenal students, ones who I want to succeed more than anything. But this is not reality. They will face tough moments. They will have hardship. We get to support, mentor, advise, and challenge, however we cannot do it all for them. Are we allowing students to discover their own, “ah-ah,” moments, or are we spoon feeding those moments to them bit by bit so they are developing the exact way we know (or perceive to know) them to need? At times, professionals want their students to succeed so much so that they aren’t able to allow that student to struggle a bit. Again, we cannot do it for them. Newsflash, y’all. We are developing too. And we don’t have all the answers. In so many ways, we are doing a disservice to students by assuming that role, and especially by projecting that on them. Ultimately, are we scared of allowing students to be in a dark place? Are we placing our own successes on the success or wins of our students? And finally as one colleague asked, are we afraid to acknowledge the pain? These are all moments of dissonance for me as professional, and in so many ways, areas that need to be identified both locally and in the larger student affairs and higher education realm.